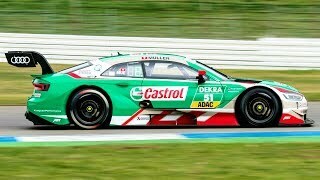 Audi has presented the DTM race car for the 2013 season, the new RS 5 DTM at the 2013 Geneva Motor Show. Eight Audi RS 5 DTM join the grid for the 2013 DTM. They are fielded by the three proven Audi Sport squads Abt Sportsline, Phoenix and Rosberg. The driver lineup will include Jamie Green (Great Britain) a newcomer and two-time DTM Champion Mattias Ekström (Sweden). The technical specification of the DTM racecar is developed with the regulations announced by DTM officials for the 2013 racing season. The performance data of the current RS 5 and RS 5 DTM are very similar, the power coming from the 4.2-liter V8 engine delivering 450 hp at 8,250 rpm and a peak torque of 317 pound-feet available between 4,000 to 6,000 rpm. 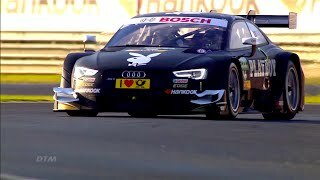 The Audi RS 5 DTM appears in action publically for the first time at the DTM test between April 26 and 29 at Barcelona (Spain) and from 9 to 12 April at Hockenheim.